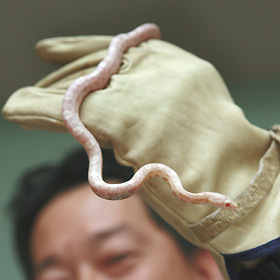 17-INCH SNAKE FOUND » Land vertebrate specialist Keevin Minami of the state Department of Agriculture displayed an albino corn snake yesterday found in Maunawili by area resident Jim Kenny. Unstable weather will persist, with showers likely into next week. Witnesses see a black Nissan Maxima flee the Makiki scene. Oahu-raised rocker Miyuki Furtado switches between musical genres as easily as he adjusted to moving to new locales. UCLA isn't up to the task of hanging with No. 4 Hawaii in the latest clash of MPSF rivals. Higher oil costs are cited as the reason for the latest increase, taking effect in April. The Turtle Bay resort will be enlarged to include five more hotels and condominiums.